Retail - No transaction type selection. Table system will be disabled. Restaurant - Transaction default to take away, assign table to transaction for dine in. Quick Serve - Comes with Eat In & To Go option, default to Eat In. Disable the option to enter pax while taking order for a table. Off - Checkout button will be disabled. In order to close a bill, you are required to click on Pay, Cash In then Checkout. On - Checkout button will be enabled. One click on Checkout button to close the bill. 2 Steps - An extra Done click is required upon checking out. Ordering 2 product A will appear 2 X product A instead of 2 line item. Identical orders will not collate if one of the order has been sent to kitchen. 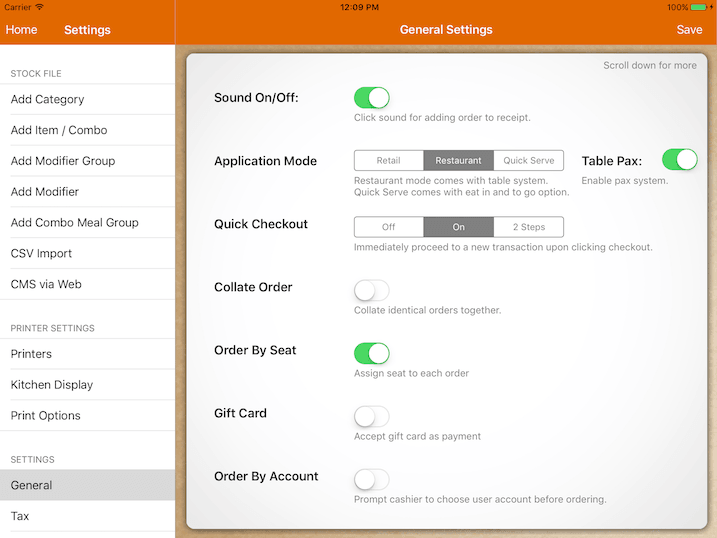 Each order can be assigned with seat number or shared by the table. Upon hold or a new bill, pop up will appear for account selection. All newly added orders's commission will be registered under selected account, even if the current logged in user is not the same as selected account. This is useful for the cashier to take orders on behalf of floor staff. Hide or disable user from accessing bill created by other user. For admin type user, they will still be able to access bill created not by them. Disable modifier's selection pop up if all modifier group under the item is optional. To add extra modifier to this order, select the order in receipt and click Edit. Rounding follows the rule of rounding to the nearest. Currency symbol will be printed in customer receipt and appear in each figure in application. Receipt prefix will append to each receipt number. Operation hour affects report generation. We recommend 00:00 as start time and 23:59 as the end time. You should not set 10:00 as your start time even if your outlet opens at that hour, because occasionally you might close the bill earlier than the start time. Outlet name is shown in the email title if email receipt function is used. Option to logout user or proceed to table layout screen when user click on Hold Bill Send Order button in cash register. By Default when your staff login, they are required to choose their account before typing in their password. This might slow down the login process when the number of staff get huge. By using Login By Password, they are not required to choose any account before typing in the password. However to use this option, you have to make sure all account's password is unique. To speed things up further more, you can use Login By QR Code. Whenever the login screen appear, the iPad front facing camera will be turned on. You just have to flash the QR Code image that contain your login password. System will decode the QR code and login automatically. An example of QR code with the password of '1234'. In actual scenario, you can print this QR code and paste it on a physical card, then laminate it. Your staff will hold the physical card, whenever they need to login, just flash the QR code to the iPad front facing camera. There are plenty of QR code generator online, you can google them. Clock In/Out chit will be printed when a user clock in or clock out. Total clocked hours will be calculated. Select the language you preferred for application interface. You could also change the application language interface based on the logged in user. This can be done under Settings -> Account -> User's Language. Changing app's language will change printing language as well, however user's language will not affect printing. Each language that is listed might not be fully translated. You could help us translate under FAQ. Upon translation, click on "Refresh Language" to retrieve the updated language files.